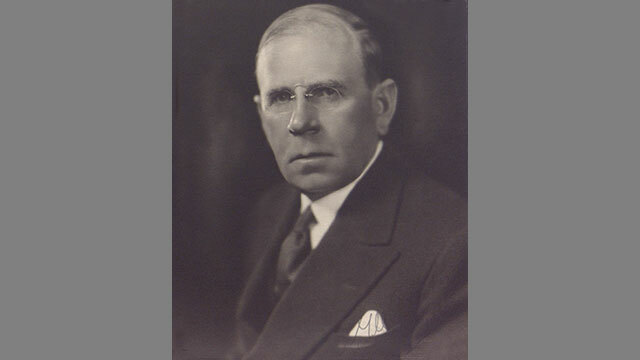 Baker Library is named after Harvard Business School’s first benefactor, George F. Baker. The Bloomberg Center extension and south-facing entrance is named to honor William Henry Bloomberg, the late father of New York City Mayor Michael R. Bloomberg (MBA 1966). 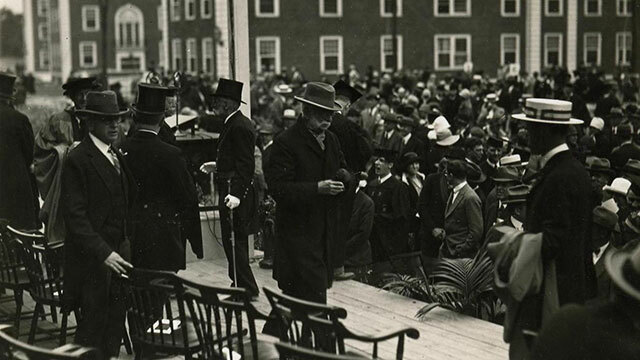 The architectural and intellectual centerpiece of the HBS campus, Baker Library was dedicated in 1927 and named for George F. Baker (1840-1931), the benefactor who funded the School’s original campus. Designed with a distinctive bell tower and columned facade by McKim, Mead & White, Baker is the largest business library in the world. 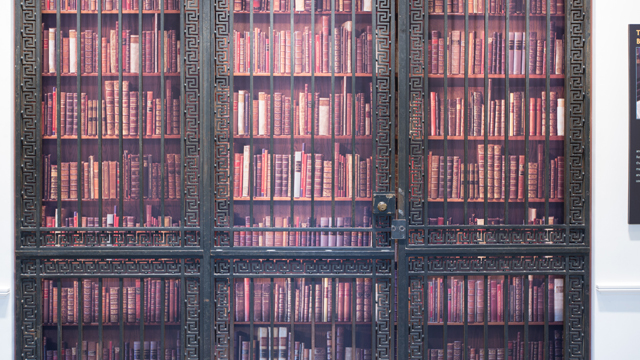 More than 600,000 volumes span seven centuries and serve as a resource for the HBS community, as well as scholars from across the globe. The iconic 184,224-square-foot building was extensively revitalized and expanded in 2003-2005, primarily with funds donated by generous HBS alumni. Special attention was given to updating and enhancing the building’s traditional functions while designing new spaces that encourage interaction and collaboration among those who work and study there. The two-year project included the creation of the Bloomberg Center, an extension of the building’s southern footprint and new south-facing entrance named to honor William Henry Bloomberg, the late father of New York City Mayor Michael R. Bloomberg. During the renovation, the building’s north-facing facade was restored, existing faculty offices were updated, and 30 new faculty offices were added. The updates incorporated modern digital media and resources, while creating accessible, environmentally controlled storage space for Baker’s vast book and manuscript holdings. In total, 38,000 square feet were added to the 130,000-square-foot building. With 67 faculty offices in Baker Library | Bloomberg Center, all HBS professors are now housed in three adjacent buildings—Baker | Bloomberg, Rock Center, and Morgan Hall—reinforcing Baker’s original function as the School’s intellectual focal point. 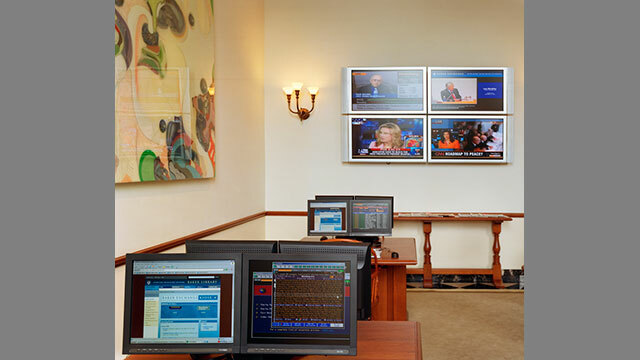 Bloomberg Center is also home to The Exchange, a first-floor gathering place that employs the latest technology to provide students, faculty, alumni, and visitors with access to real-time business news and financial information. 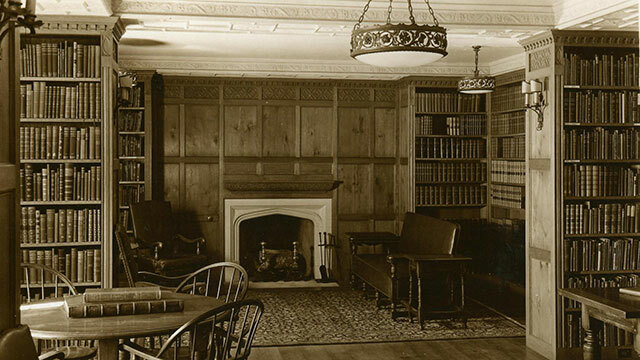 Highlights of enhancements in the original section of Baker include the de Gaspé Beaubien Reading Room, which houses the School’s renowned historical collection of rare business books, the largest in the world, and documents dating from the 15th century. The new Frist Faculty Commons comprises a dining area and lounge that replaces the former Faculty Club in Kresge Hall, a space where faculty can gather for lunch. Flanking the Commons are three seminar rooms used by faculty and doctoral students. The Stamps Reading Room, on the second floor, a majestic space and gateway to all library areas, was carefully restored and updated to include wireless Internet service. 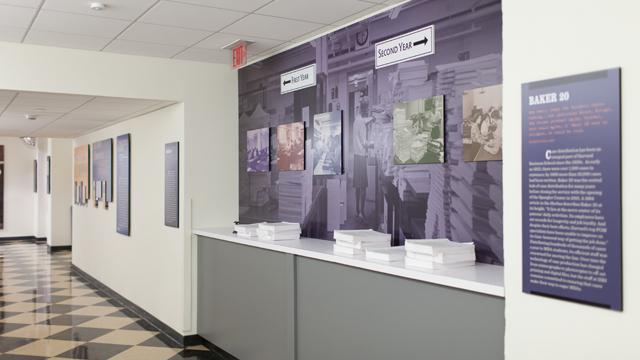 The space also houses some historical treasures for the School, including the Written Analysis of Cases slot; the Baker 20 case distribution center; a rendering of the originalBaker Library stacks and grille; and an original booth from the New York Stock Exchange, which was removed in 1980 when the exchange converted to electronic record keeping and displays. A prominent financier, philanthropist, and president of the First National Bank of New York, Baker was an extraordinary business leader. At the age of 23, he invested $3,000 to become an original shareholder in the First National Bank, where he worked as a teller. Just 14 years later, he became the bank’s president. Under his conservative management, the institution remained financially sound throughout the panics of the late 19th and early 20th centuries. Baker’s business acumen extended to serving on the boards of more than 40 corporations, including several failing railroads that he bought and revitalized. He also had great success investing in the utilities, steel, and rubber industries. Although he famously kept a low profile, leaders of business and government consistently sought and received his advice. Dean Wallace B. Donham allowed the Bakers much leeway in the naming of first campus buildings, but it was at Donham’s strong suggestion that the library was given the Baker name. Michael Bloomberg’s life story is one of self-made success in finance, business, and politics. The son of real-estate agent William Henry Bloomberg and Charlotte Rubens Bloomberg, the future mayor of New York City grew up in Medford, Massachusetts, and worked his way through college, earning an undergraduate degree in electrical engineering at Johns Hopkins in 1964. After graduating from HBS, Bloomberg spent more than a decade on Wall Street, where he headed equity trading and systems development for Salomon Brothers. In 1981, he launched a company based on the idea that Wall Street would pay for high-quality information delivered quickly and accurately through innovative technology. Today, Bloomberg LP has over 15,000 employees in 192 locations, offering data, analytics, and financial information to subscribers across the globe. 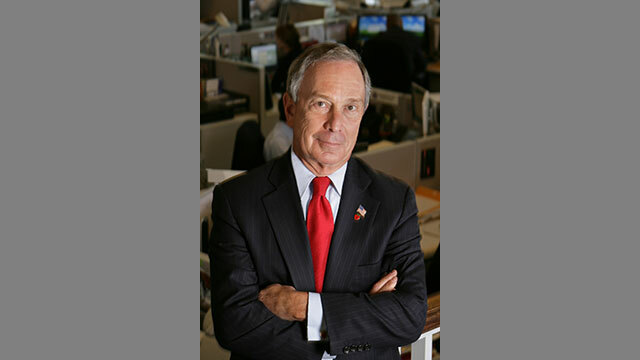 While building his business, Bloomberg became engaged in civic affairs through his philanthropy. He entered public life in 2002, becoming mayor of New York City after a successful, self-financed campaign. He won reelection in 2005 and again in 2009. The popular politician often rides the city’s subway, does not collect a salary, and has identified public education and poverty as priority issues for the city. In recent years, Bloomberg has also taken strong public stances on a variety of national and international issues. The Bloomberg Center is named for Bloomberg’s father, Henry, whose father was a Jewish immigrant from Russia. Bloomberg has said that his philanthropy is inspired by his parents’ emphasis on public service and the importance of giving back. His Bloomberg Philanthropies foundation supports the arts, education, the environment, government innovation, and public health. In 2011, the Chronicle of Philanthropy listed Bloomberg Philanthropies in the top 5 on its list of America’s top 50 philanthropies. Bloomberg has two daughters who share his involvement in philanthropy. Emma Bloomberg (MBA 2007) is chief of staff at the Robin Hood Foundation, a nonprofit dedicated to fighting poverty in New York City. Georgina, an accomplished equestrian, serves on the board of the Equestrian Aid Foundation. Emma is married to classmate Christopher P. Frissora (MBA 2007). The bell that hangs in the Baker Library bell tower, and the ceremonial bell that stands in front of the library, represent a very special gift that was given to Harvard University in 1930. 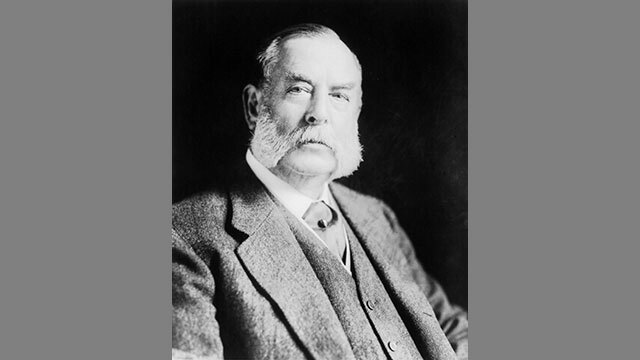 Charles R. Crane, an American industrialist and diplomat, purchased the original bells and gave them to Harvard to prevent them from being melted down for ammunition as antireligious fervor swept through Stalin’s Russia. The bells—the oldest cast in 1682—originally pealed atop the gate tower of the Danilov Monastery and comprise one of a few sets that survived Stalin’s reign. Bells are known as “singing icons” in the Russian Orthodox Church, calling the people to prayer and serving as daily reminders of one’s faith. One bell was installed in the cupola above Baker Library and the other 17 were installed in Lowell Hall on Harvard University’s campus. 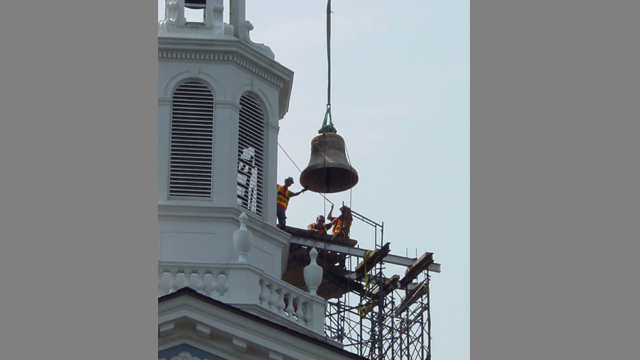 The bell that was installed on HBS’s campus was returned in 2007 and was reinstalled in the Moscow monastery. The other 17 were returned one year later. The replacement bell in the Baker Library tower is a replica, and a ceremonial bell—installed at the time of the School’s centennial anniversary—was placed in front of the building. Both were cast by the Vera foundry in southwestern Russia. 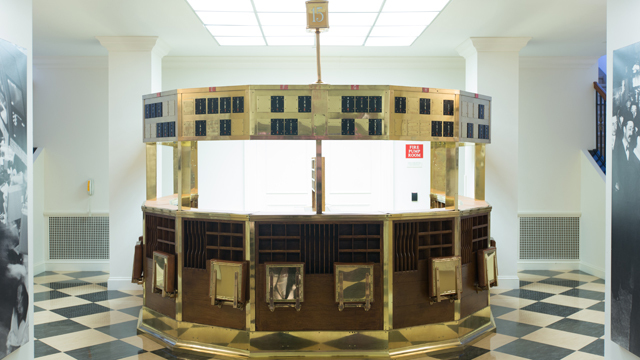 The ceremonial bell features images of both Baker Library and the Danilov Monastery and was funded by The Link of Times, a foundation that scours the world for lost Russian artifacts and helps return them. 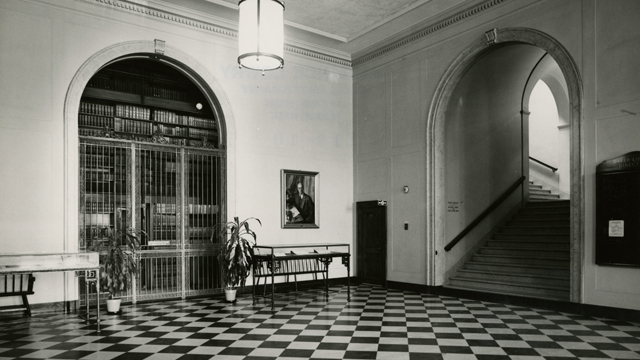 This grille was a prominent architectural feature in the Baker Library lobby before a full renovation in 2003. Designed by the firm McKim, Mead & White, creators of Harvard’s famous Johnston Gate, the grille was intended to be both aesthetically pleasing and practical. 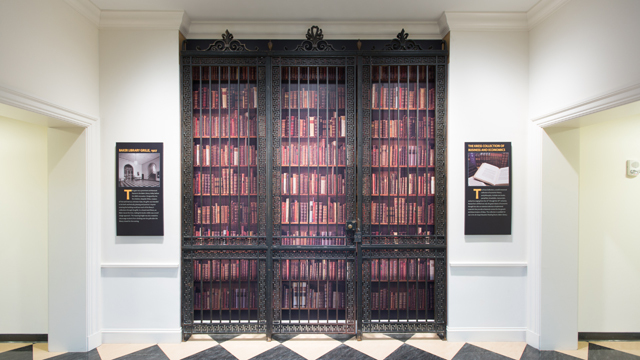 Anyone entering the building would see much of the library’s collections through the grille. In a closed-stack library, as Baker was at the time, making the books visible was a novel design approach. 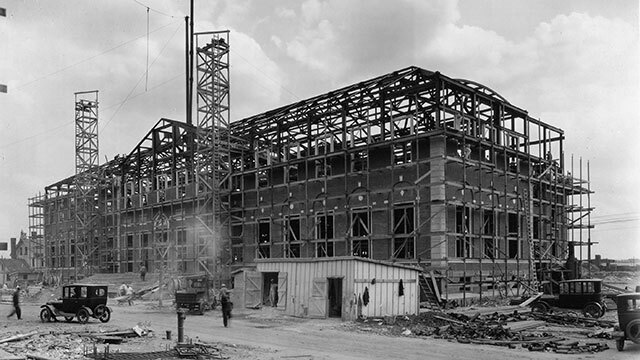 The imposing height was also created to discourage students from climbing over the grille after the library closed for the evening. Funds for the interpretive exhibition of this artifact were given by Jed Bullard (MBA 1975), a longtime supporter of and dedicated volunteer for HBS. 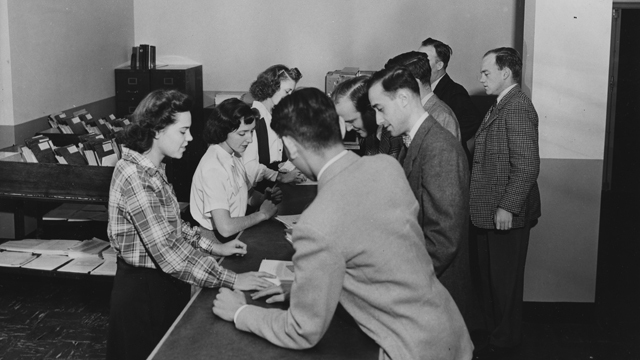 Case distribution has been an integral part of Harvard Business School since the 1920s. As early as 1922, there were over 1,500 cases in existence; by 1968 more than 30,000 had been written. Baker Library room 20 (affectionately called Baker 20) was the central hub of case distribution for many years before closing for service with the opening of the Spangler Center in 2001. A 1984 article in the HBS Harbus newspaper describes Baker 20 at its height: “It lies at the nerve center of its patrons’ daily activities. Its employees have set records for longevity and job loyalty. 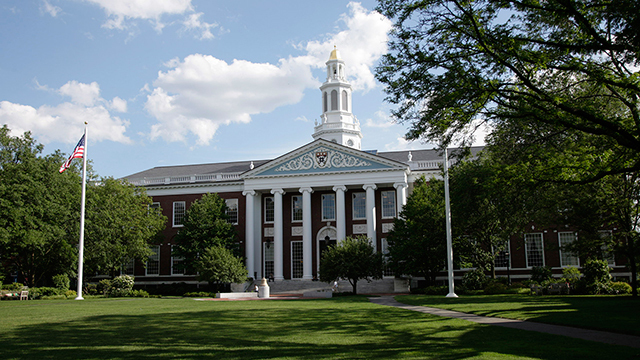 And despite their best efforts, Harvard’s top specialists have been unable to improve on its time-honored way of getting the job done.” Distributing hundreds of thousands of cases a year to MBA students, its efficient staff was renowned for moving the line. 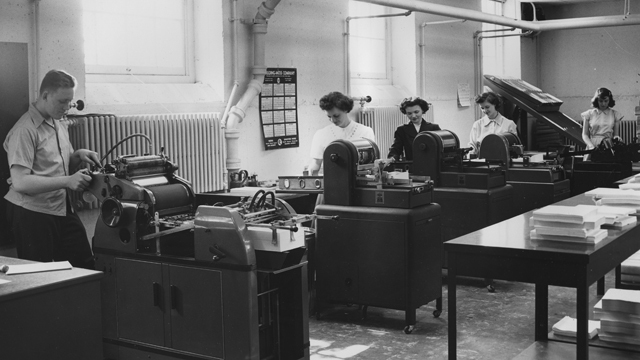 Over time, the technology of case production has changed from mimeographs to photocopies to offset printing and digital files, but the staff at HBS remains committed to ensuring that cases make their way to eager MBAs. Funds for the interpretive exhibition of this space were given by Jed Bullard (MBA 1975), a longtime supporter of and dedicated volunteer for HBS. 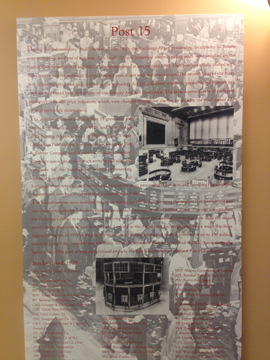 From 1914 to 1993, several incantations of written assignments were required of MBA students. The longest running and most storied of these is the Written Analysis of Cases, or WAC, assignment. It comprised analyses of each case discussed in the first-year MBA classrooms. This process was justified by the faculty. Professor Thomas J.C. Raymond said, in 1954, “because when schooling is over and the graduate has embarked on his business career, no one will hand him a case. Instead, the graduate will have to go out and in effect put together his own case before he can use the skills learned at HBS.” WAC report writing was designed to train students to do just that. The slot where the WACs were deposited at the west end of Baker Library is memorialized today with a bronze plaque. 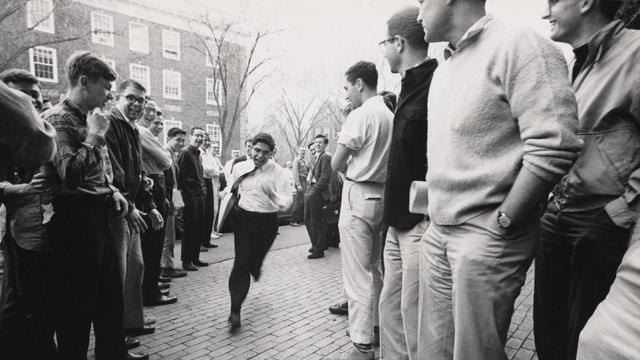 MBA students would line up and cheer each other on as they ran from their dorms to the slot to deposit their WACs before their dreaded deadlines. 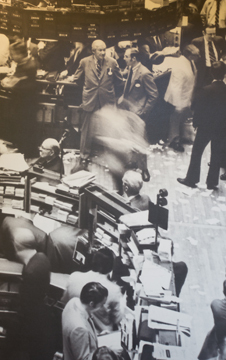 From 1871 onward, stocks within the New York Stock Exchange trading floor were assigned permanent locations so that brokers could quickly locate the specialist in each stock. These first “trading posts” were simply upright poles topped by signs, with some chairs at their bases. 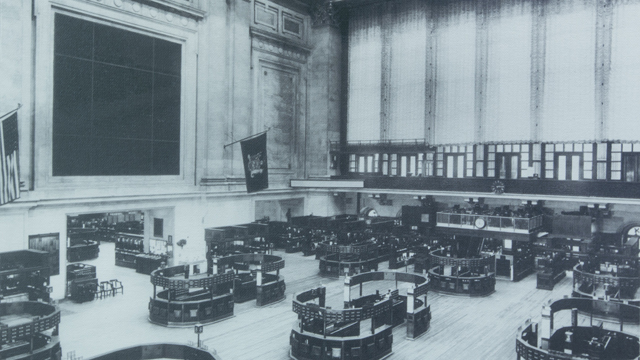 During the extraordinary “bull” market of the 1920s, the New York Stock Exchange began reassessing its capacity to handle ever increasing amounts of business and moved from the pole system to 17 new horseshoe-shaped trading posts between 1929 and 1932. Each post was solidly crafted, with brass frames; oak counters; and leather-covered, push-down seats and countertops. The smooth lines of the brass and slight flaring foot tails hinted at the prevailing Art Deco fashion, while the pigeonholed interior oak cabinets harkened back to the turn-of-the-century Arts and Crafts style. The brass superstructure of each post held more than 100 price indicators, which were changed throughout the day to indicate the most recent sale price of each stock traded there. All of the horseshoe posts were replaced in 1981. Recognizing the significance of the posts as important cultural artifacts, HBS acquired Post 15 for display.